At 6.9 lbs. 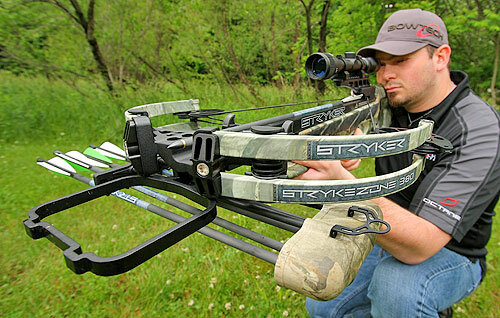 nominal weight, the newly-designed Stryker StrykeZone 380 by Bowtech is the lightest crossbow of the group tested. Full-rigged with all packaged accessories including scope sight, quiver and five arrows, and sling, it still weighs just a freckle under 8.5 lbs. It also has the narrowest axle-to-axle width of the group: 19.19 inches uncocked, and 15.38 inches cocked. Plus, it is very fast, and powers a 437-grain (1.0 ounce) arrow at a measured 378 feet per second; making it one of the fastest crossbows on the market. The StrykeZone 380's draw weight is 160 lbs, with a 15.5 inch power stroke. Manual cocking is made easier by the unique pull angle of the supplied length-adjustable cocking rope. The one-piece molded polymer stock and forearm housing is available in choice of Gore Optifade Forest or Mossy Oak Treestand camo finishes. The StrykeZone's "semi-bullpup" design makes for a short buttstock and permits the scope to be mounted with a very close eye-relief; which suits my shooting style because crossbows have no rearward recoil. The full pistol grip allows a firm pull backward on the bow to tuck it closely into the shoulder pocket. Stryker's new competition-grade trigger mechanism offers a consistent trigger pull of less than three pounds. Another excellent feature is the "skeletonized" configuration of the bow's forearm grip, which virtually guarantees your thumb or fingers will never protrude above the barrel and be struck by the bowstring when firing. Also, Stryker's new insertable/removable Cease-Fire Loading Safety pin completely blocks the firing mechanism when the bow is cocked, allowing a bolt to be loaded in complete safety. The StrykeZone 380 is lightweight, accurate, and extremely maneuverable, even in dense brush or a close-quarters blind. I like it. Axle-to-axle width (cocked): 15 38"
Group sizes data is average of three, three-arrow groups from benchrest at 30 yards with scope provided by manufacturer. Velocity data is average of five arrows measured 36 inches from muzzle. Weight is setup as tested, with all package accessories installed. Arrows as supplied by manufacturer with package. Arrow weight in grains as fired, with practice tips as supplied. Axle width measured center-axle to center-axle. Trigger pull measured with Brownells Trigger Gauge.